Life is live! Fujitsu's Lifebook family got offspring. The Lifebook E751 with vPro- and UMTS support sports a matte 15.6" display and is priced at 1350 Euros. Read on, to see what else was laid into the youngster's crib. 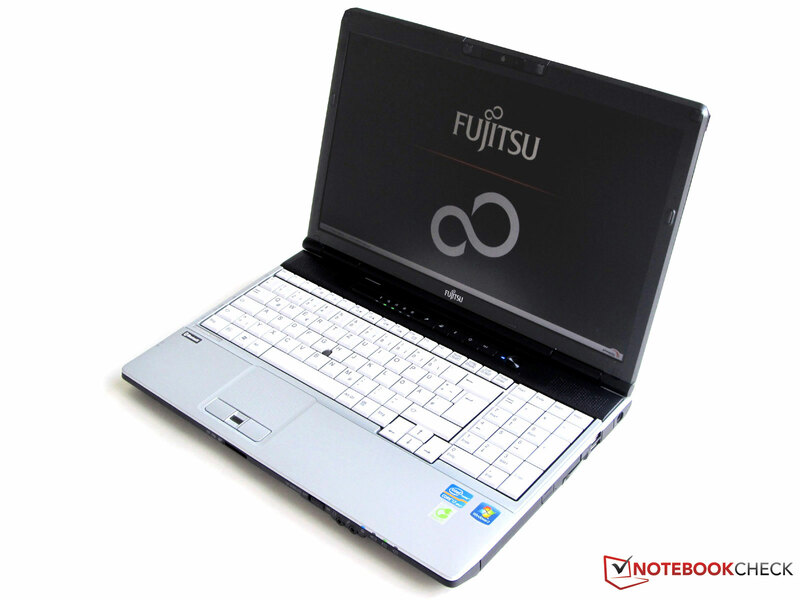 Fujitsu's first new arrival, the Lifebook E751 vPro/UMTS is a typical specimen of the 15.6 inch class. Its endowed with Intel's second generation dual core processor, the Sandy Bridge based Core i7 2620M clocked at 2.7 GHz. The integrated Intel HD 3000 GPU takes care of display chores. In addition, the notebook is equipped with a non-reflective 15.6 inch (39.6 cm) display with a welcome resolution improvement over standard screens of 1600x900 pixels. As is customary for a mobile computer, the Lifebook E751 offers WIFI, Bluetooth, and even an internal 3G/UMTS capable modem. You'll find a SIM card already present - the ploy is getting you to register it with the telecom company (o2) to get the first month free. Further, you'll find a docking station and a secondary power supply in the box. This is pretty useful, as it allows you to leave one at home and the other one at the office. The roughly 1 lbs (450 gram) at which they tip the scale won't be missed on your way home or to the office. The docking station offers further interfaces and charges the battery at the same time. Lastly, the notebook sports a 500 GB hard drive, 4GB RAM, and a DVD writer. With this level of equipment, the Fujitsu Lifebook E751 vPro/UMTS is supposed to cost 1350 euro. The notebook's case is kept in the classic colors black and white. Materials used are predominantly plastic, but the appearance doesn't suffer from that. The clam shell of this model is black, wrist rest and sides are silver and look - in the same style as the model Celsius H710 - as if they were worn from use. 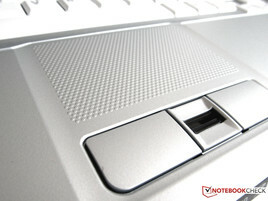 The notebook's workmanship is good, just stability suffers from the plastics used. Demerits are given for the back cover of the display lid, which can be pushed-in all too easily. The display lid is easy to open with one hand, without the base of the notebook trying to follow. 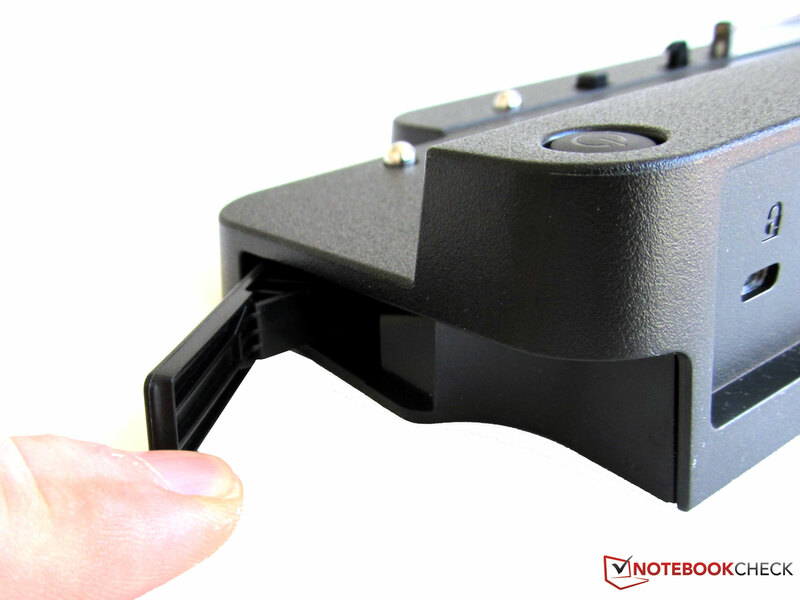 The display bezel is held by two hinges with a tight grip, and even using a lot of force, it only bends slightly. When closed, the display hinges offer too little grip, which results in the display frame rattling on the base. 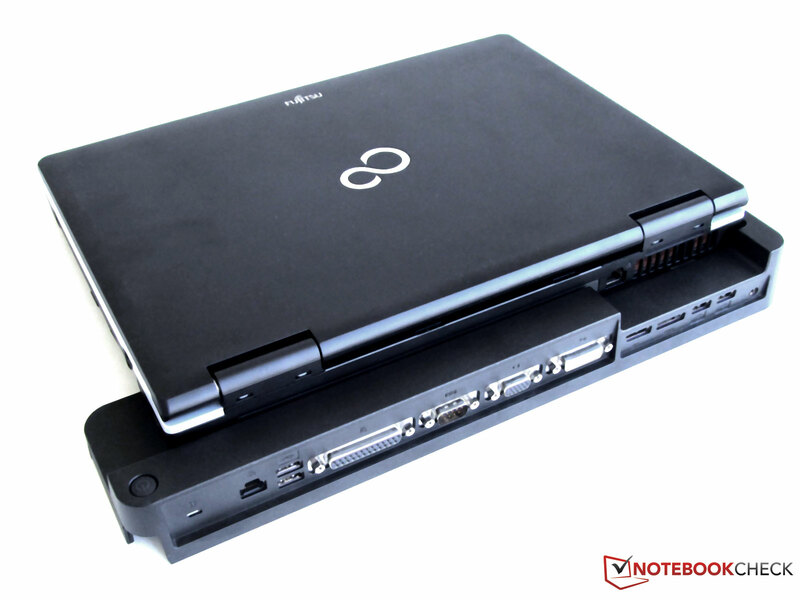 The Fujitsu Lifebook E751 weighs 5.5 lbs (2.5 kg), including the 6 cell battery. The power supply adds another 1 lbs (450 grams). At 14 2/3"x9 2/3"x1 3/8" (35x372x245 mm) the outer measurements are no more chunky than most notebooks with this screen size, excepting slimline models. In regards to interfaces, pretty much everything imaginable is built in. What can't be found is covered by the included docking station. The number of connectors is impressive and enables every common task. 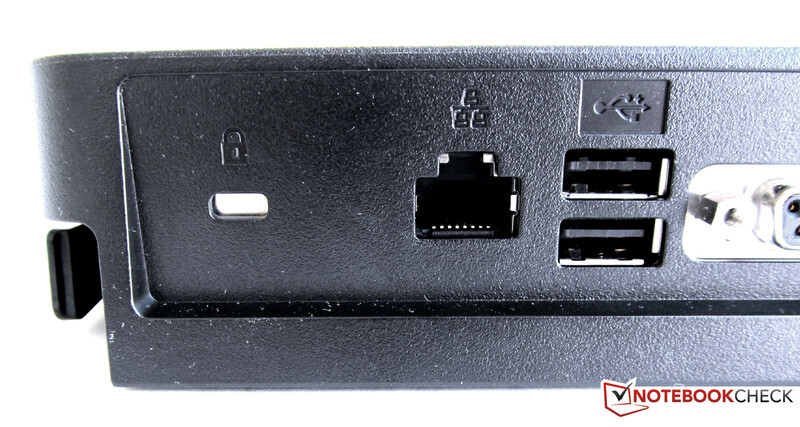 There are 3 USB connectors for external devices, one of them supporting USB 3.0. On the right side, one of the USB connectors offers "Anytime-USB-Charge" functionality, allowing you to charge mobile phones, mp3 players and other electronic gadgets while the notebook is turned off. 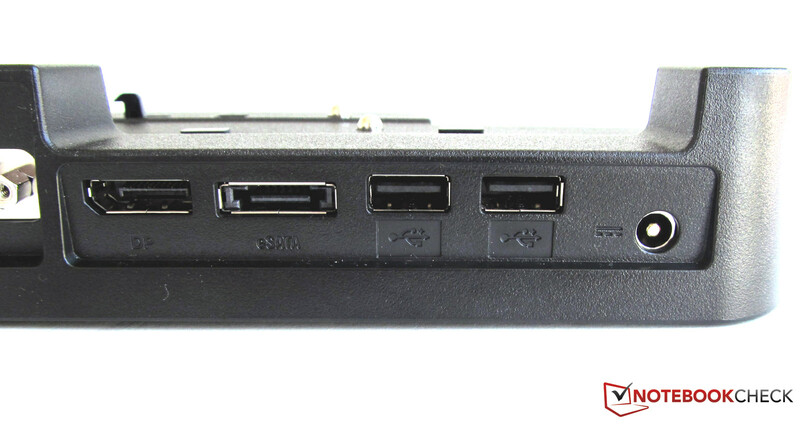 There are 3 USB connectors for external devices; one of them supports USB 3.0, and another, on the right side, sports "Anytime USB Charge" functionality. This allows you to charge mobile phones, mp3 players and other electronic gadgets while the notebook is powered off. 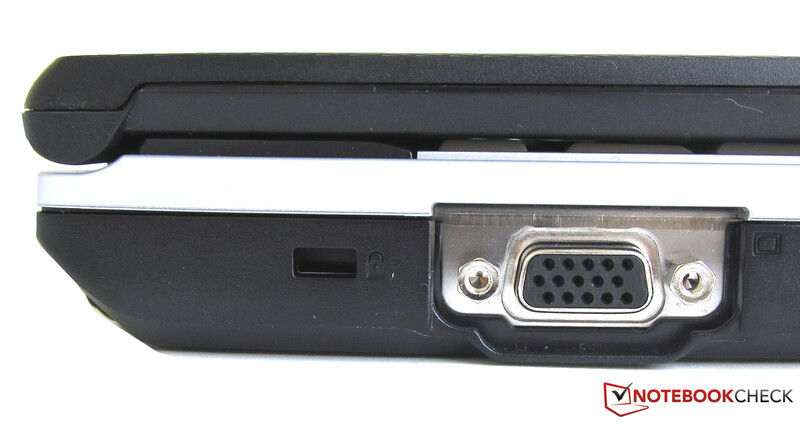 Further interfaces available on the LifeBook E751 are one eSATA / USB combo, one RJ45 Gigabit LAN connector, one ancient RS232 serial port, as well as the usual audio I/O for headphones and microphone. 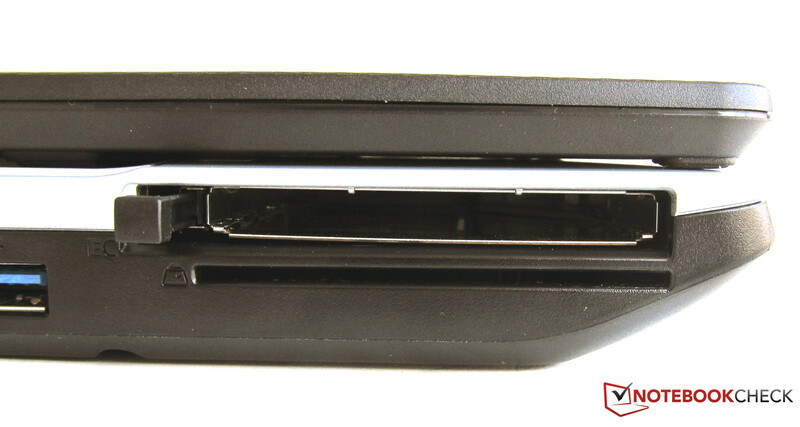 On the sides, we also find an ExpressCard/54 slot and a smart card reader for use with such things as credit cards or health insurance cards. 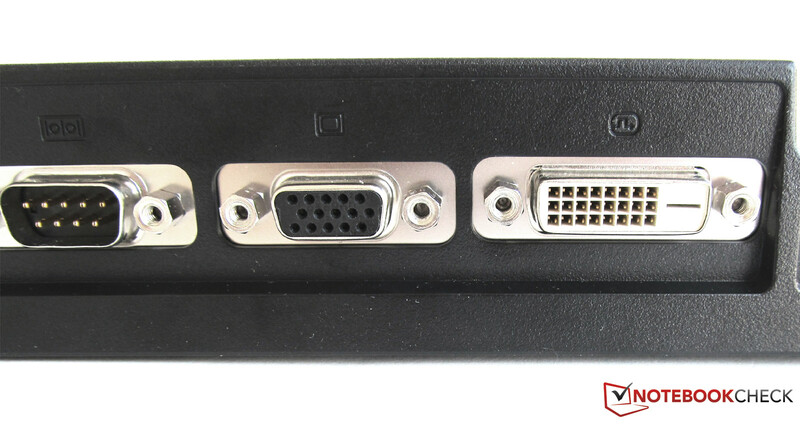 For connection of external monitors, the LifeBook E751 carries a display port and an old analog D-Sub VGA connector. 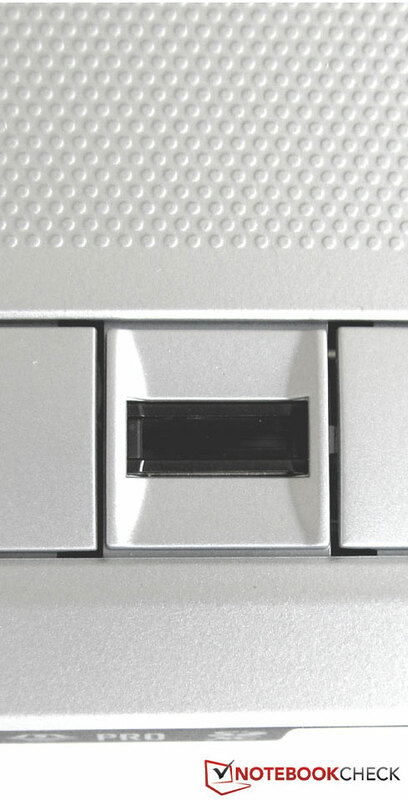 The Fujitsu notebook's placement of connectors is acceptable; they are all easily accessible, and the layout is sensible. Two of the USB sockets are placed a bit too close together though, thick connectors or USB sticks might not be possible to plug into both simultaneously. 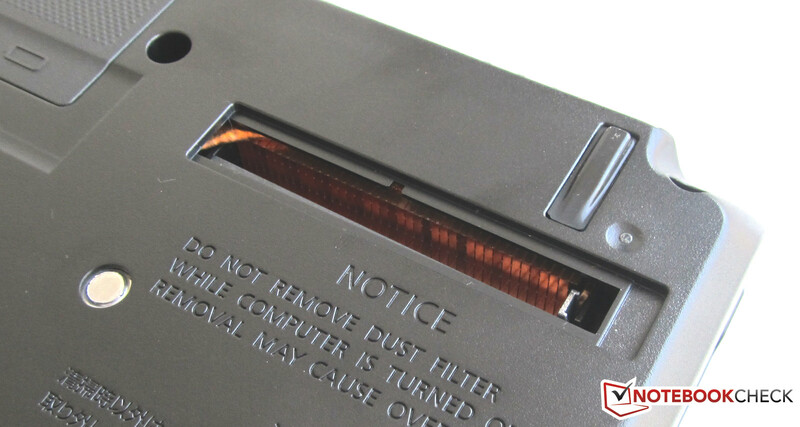 The card reader at the front of the base supports SD/MMC and MS/MS Pro cards, but lacks a dust cover, exposing it to the hazards of the surrounding environment. This issue can be alleviated by keeping a MemoryStick Pro card plugged into it, in effect sealing it off. Fujitsu could have thought of this in the engineering phase of the E751. 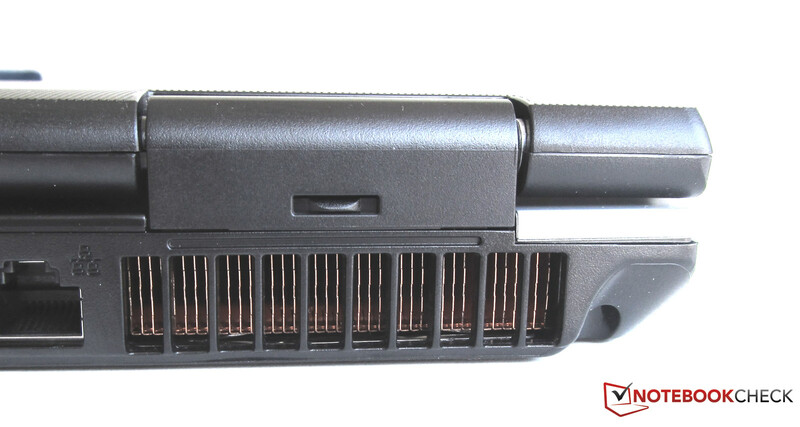 They did find a pretty clever solution with the modular drive slot on the side; In this model, it houses the DVD writer, but alternatively, a secondary battery, hard drive, SSD drive or Blue-Ray writer can be swapped as needed. 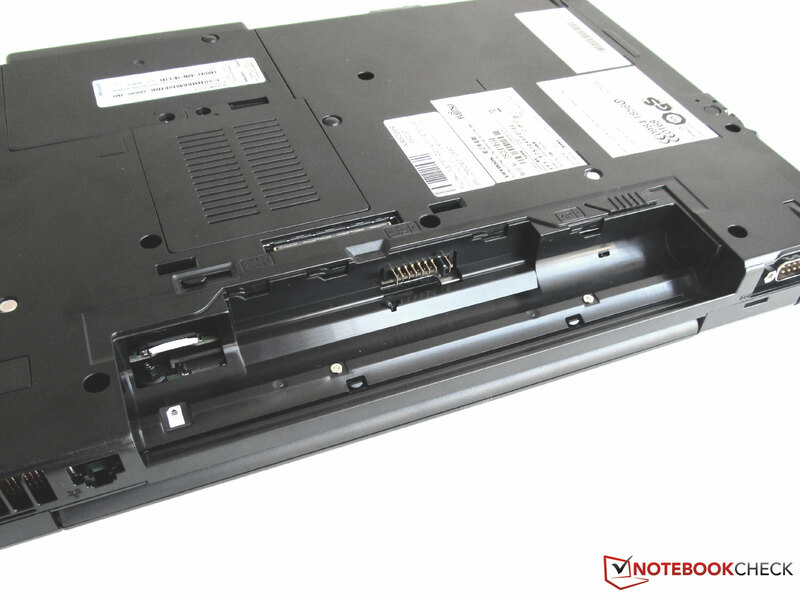 Those who would prefer to simply reduce the weight of the notebook can simply install an empty plastic cover. 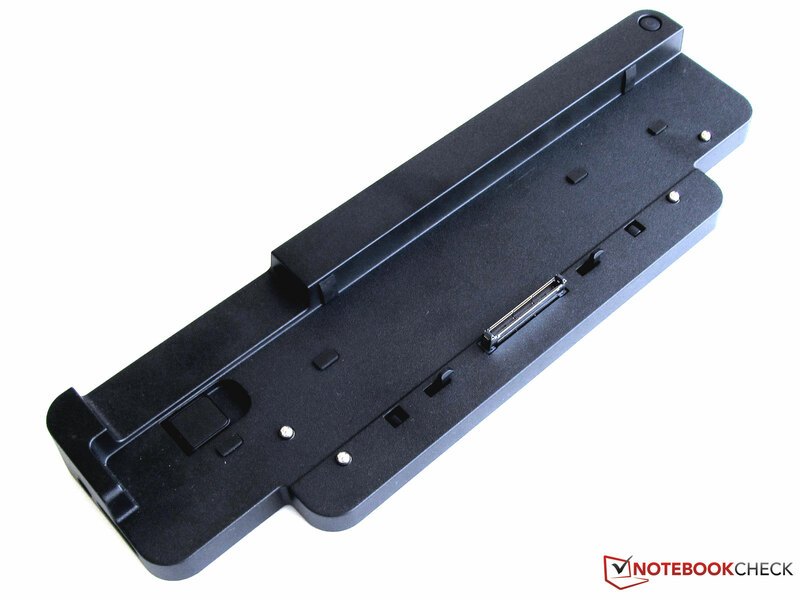 The connector for the included docking station is actually underneath the notebook. 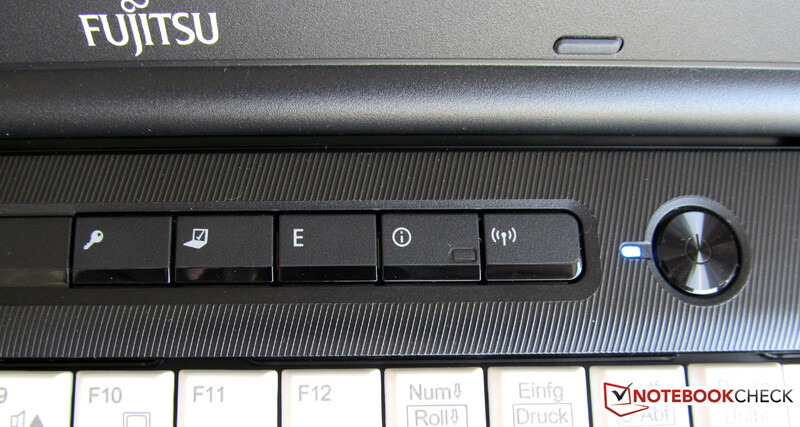 Fujitsu's LifeBook E751 offers several ways to get on the network: a Gigabit RJ45 interface to get wired up, or 802.11 b/g/n WIFI with dual antennae for wireless hook ups. In addition, the LifeBook E751 sports Bluetooth 3.0, as well as an integrated 3G/UMTS radio, which already had a SIM card in it, as we mentioned above. Three tariffs are offered for the LifeBook E751 in Germany: a daily flat rate for 2.95 euros running from midnight to midnight, a monthly "flat rate 500" for 9.95 with a 500 MByte transfer volume, and a second monthly "flat rate 5000" with 5GByte transfer volume, for 24.95 Euros. There is no SIM lock, so any SIM card from local vendors of your choice can be used. The LifeBook E751 is equally well equipped in regards to security, offering biometric log-in protection with its finger print sensor. 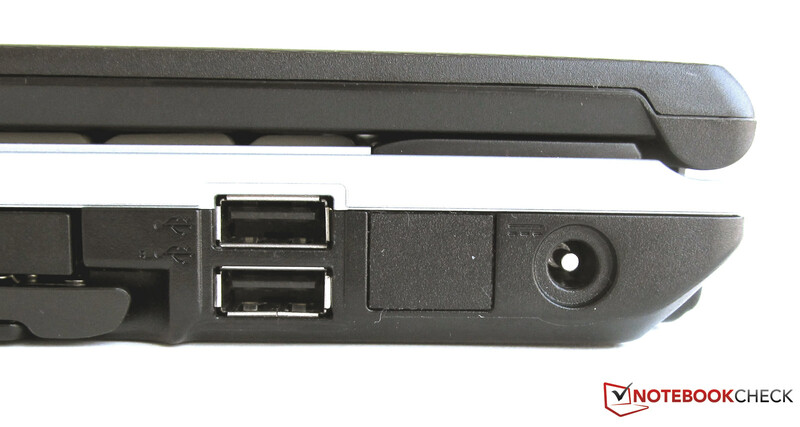 It comes with two Kensington Lock connectors, one on the notebook, one on the docking station. For maximum security, the LifeBook sports a CompuTrace enabled BIOS with ATP (Advanced Theft Protection), integrated smart card slot and TPM module. 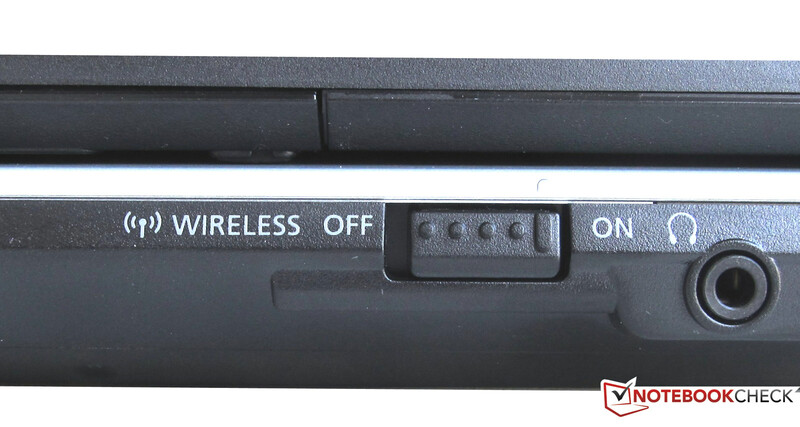 In case of theft or loss, ATP allows tracking down the notebook by GPS and WIFI as soon as it connects to the internet. Optionally, ATP can erase the contents of the hard drive remotely. More information in regards to ATP can be found here. This model includes 12 Months Collect & Return/Bring-in warranty, which can be extended with service packs up to 5 years. Fujitsu's online shop offers various packages with on-site or bring-in service. Extending warranty to 5 Years with bring-in service costs 72.50 euro, with on site service 353.40 euro. Service packs can only be purchased till 90 days after purchase. Fujitsu does not limit accessories to the essential for this model. Aside from leaflets, numerous CD's and DVD's are supplied. Among them we find a Recovery DVD of Windows 7 (32bit and 64bit), Nero 9 Essentials and a disc with drivers and manuals for the system, as well as Premium Suite 2011, containing Corel Home Office, Abby PDF transformer 3.0 and a various graphics software from Corel and Serif. A 60 day trial version of Norton Internet Security 2011 is pre-installed. 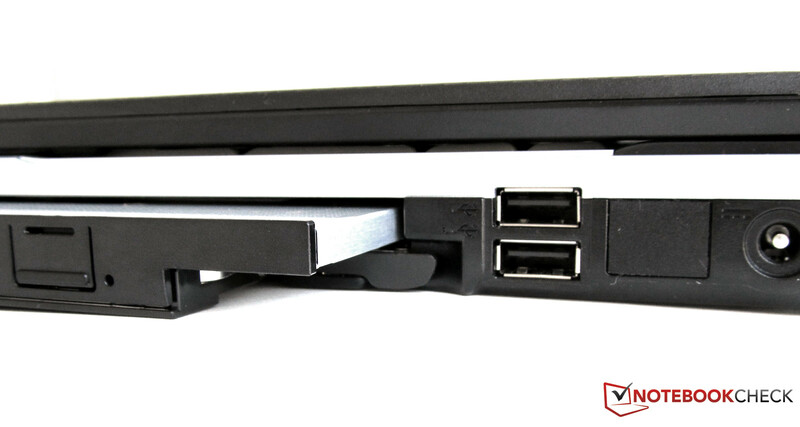 Next to the power supply for the LifeBook E751, there is a second power supply and a matching docking station. 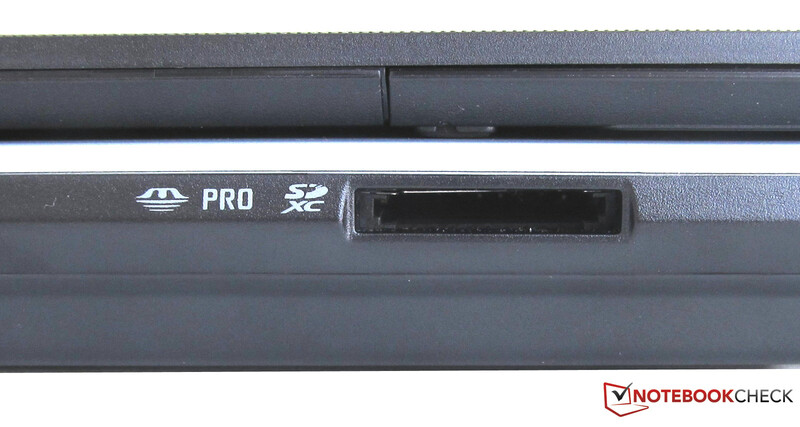 Fujitsu's online shop offers a docking station (part number: S26391-F987-L110) for 122 Euros, the power supply for 40 Euros. 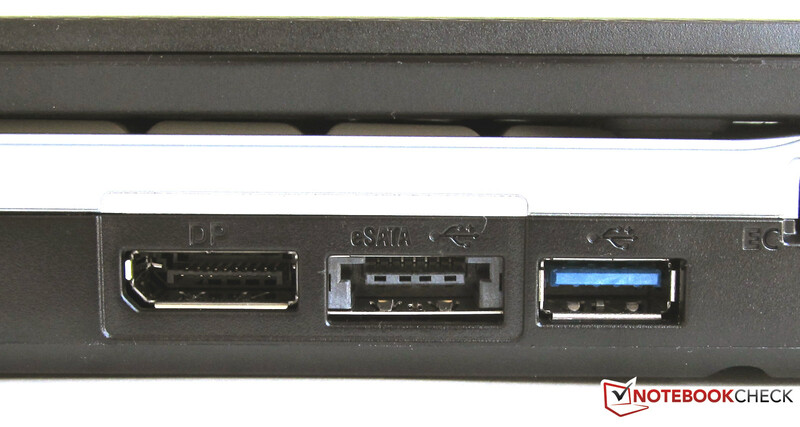 The docking station expands the LifeBook E751 with 4x USB 2.0, 1x VGA, 1x DVI, 1x DisplayPort, 1x Parallel and 1x eSATA. 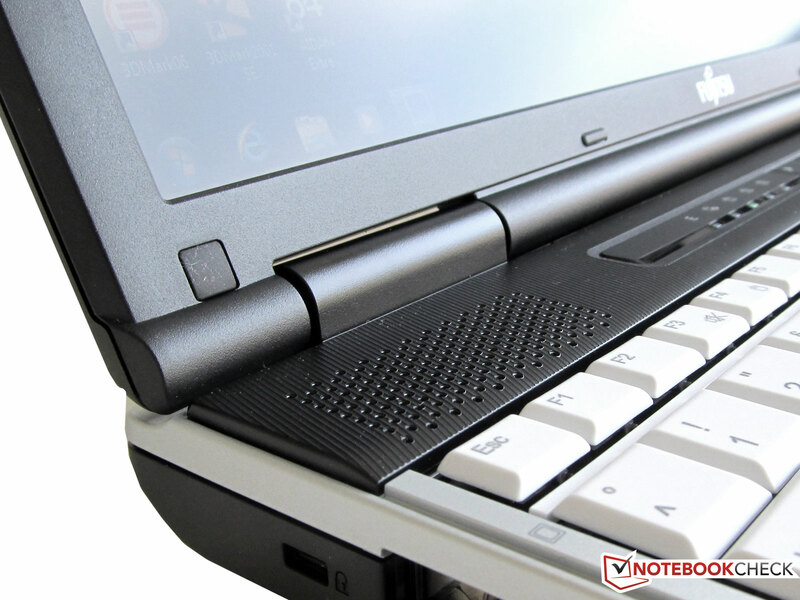 Beyond that, the notebook can be charged by the power supply of the docking station. 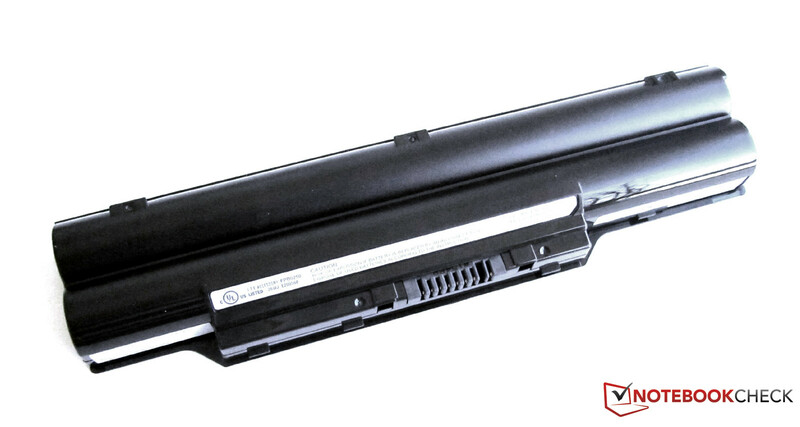 Also available in Fujitsu's online shop: secondary batteries, (Li-Ion 6 cell battery with 3,800 mAh, 41 Wh) for 133 Euro, fitting the modular expansion slot, so that it can be swapped in place of the DVD drive. 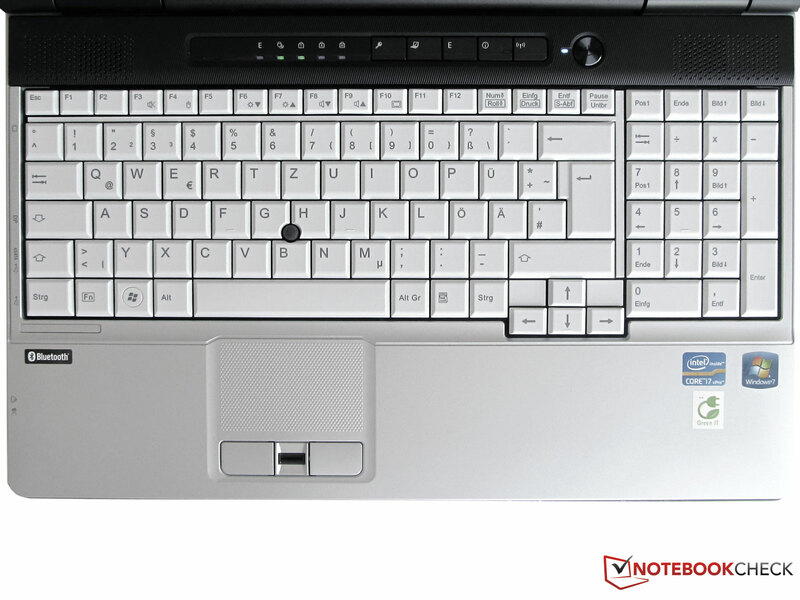 Fujitsu's LifeBook E751 offers a white, spill-resistant QWERTY keyboard with 106 keys and a separate number pad. 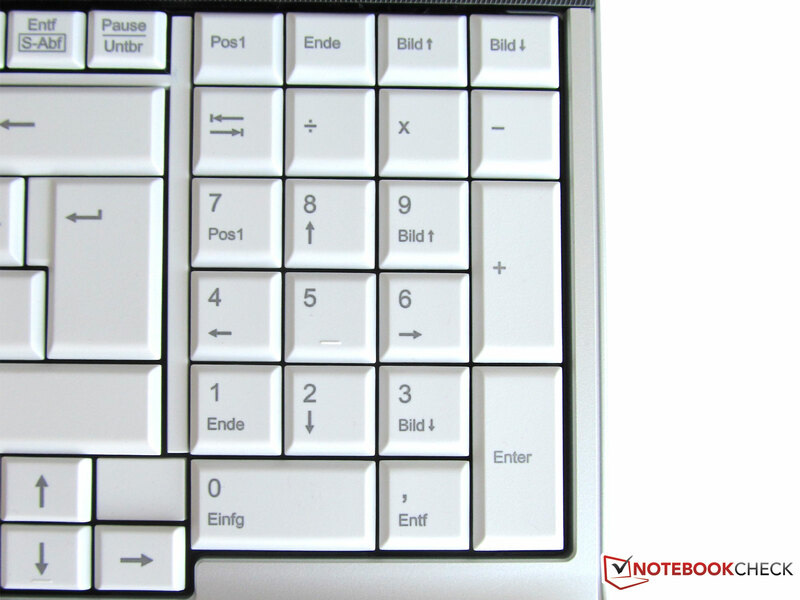 The full size keyboard utilizes the full width of the notebook and was easy to type on in our test. 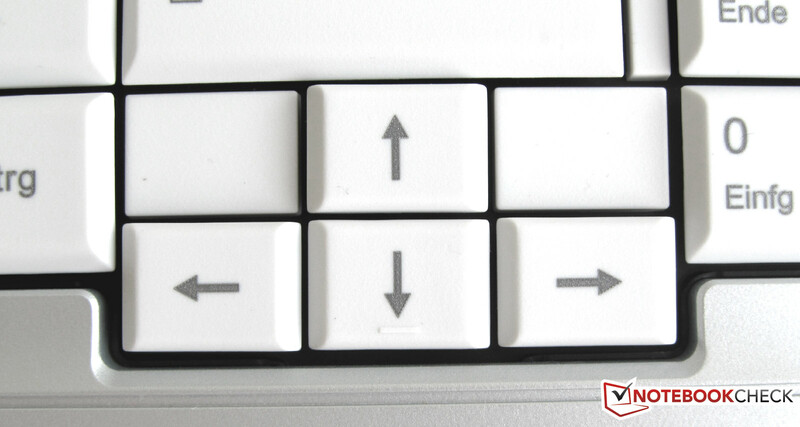 The arrow keys are very small, like the Fujitsu Celsius H710, among many others. 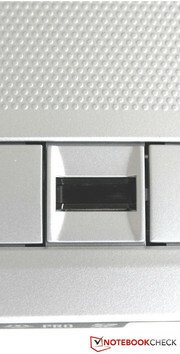 Fujitsu placed 6 special keys above the keyboard. One key, for example, immediately locks the operating system. Another key brings up a menu with direct selection of various presets for power settings. Yet another special key brings you directly to the networking management screen. 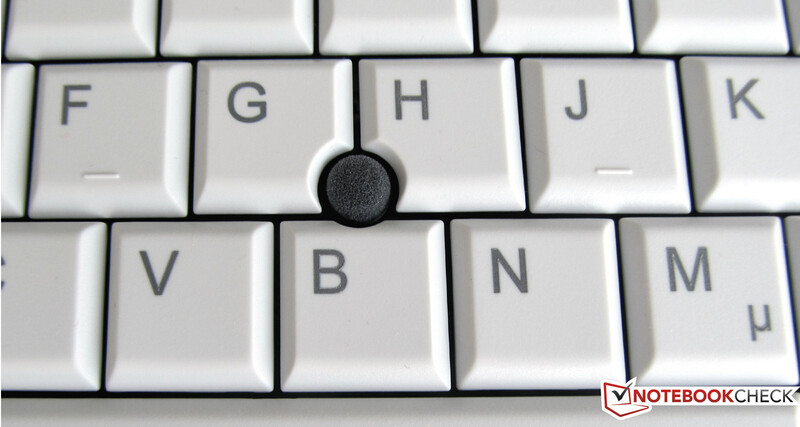 Between the "G-H-B" keys, there's a track point, that can be used instead of a mouse. In front of the keyboard, you find a touch pad with a knobbed surface supporting gestures. 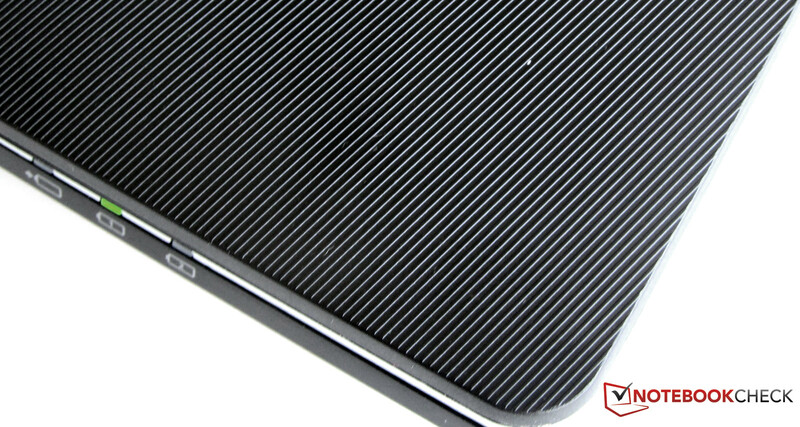 The scroll area often found on the right edge of touch pads is missing on this notebook. Gliding around the touch pad's surface works very well, you can feel each individual knob. In front are two buttons acting as - you guessed it - mouse buttons. The finger print sensor sits in between them. 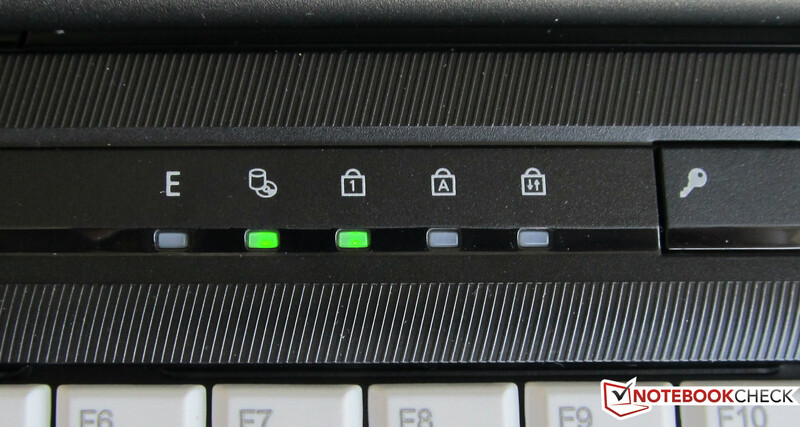 The touch pad can be deactivated with the "Fn+F4" key combo. The fact that both touchpad and track-point always get activated/deactivated together is pretty annoying, however. 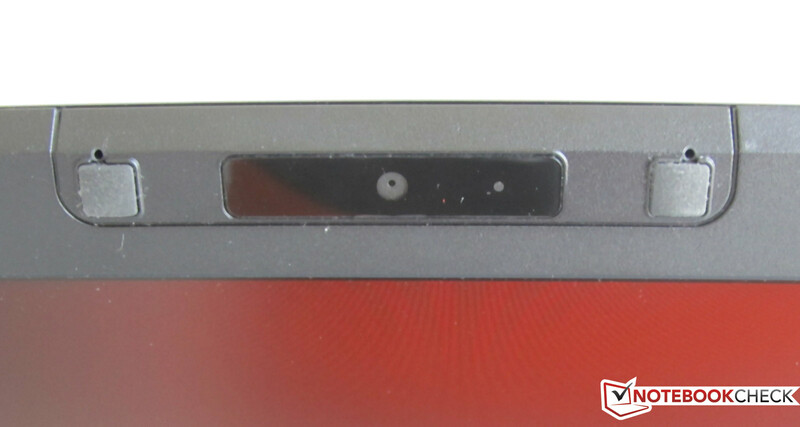 Centered above the HD+ display is an integrated 1.3 megapixel webcam for use with Skype or any other software you like. Our version of the LifeBook E751 es equipped with an LED back-lit 16.6 inch display, boasting a resolution of 1600x900 pixels (HD+) in the usual 16:9 ratio. Fujitsu also offers E751 series notebooks with plain HD panels limited to displaying only 1366x768 pixels, which is less than ideal to work with full document view in word processors. The matte display panel is almost perfectly non-reflecting. 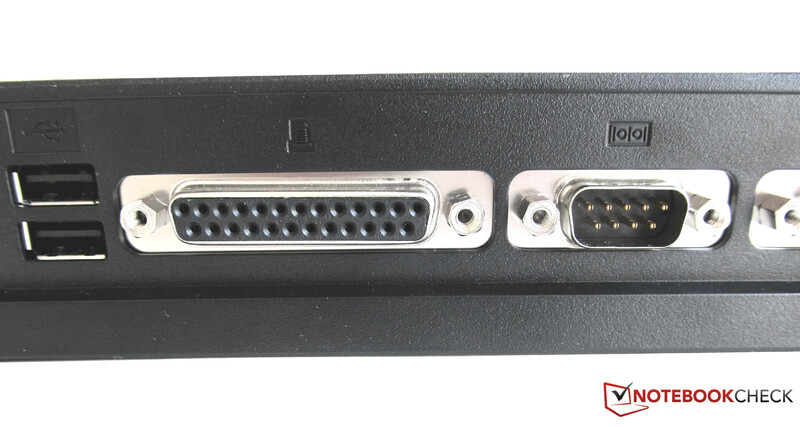 Additional displays can be connected using the VGA and Display-Port connectors, allowing work with multiple displays simultaneously. The desktop contents can either be spread across all displays or cloned, to show the same thing on every monitor or projector. 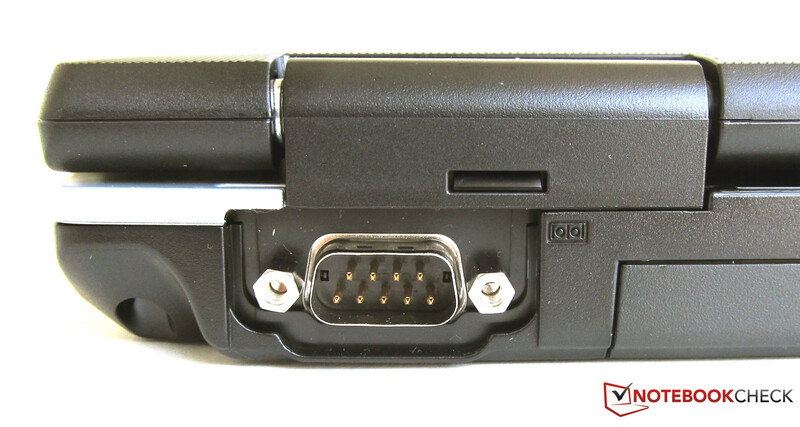 Video output is handled by the integrated Intel HD 3000 GPU, which does not have its own video RAM, so it has to borrow what it needs from the system RAM. With maximum brightness, we took nine measurements and noted values between 176 and 207 cd/m² (average 190,2 cd/m²). Distribution of brightness was at 85%. The non-reflective display works well outdoors. While the color intensity of our test video was reduced outside, colors were still recognizable. Working outdoors with the Fujitsu E751 vPro/UMTS was possible under all conditions, but another 50 to 100 candelas would have made the display a lot better. 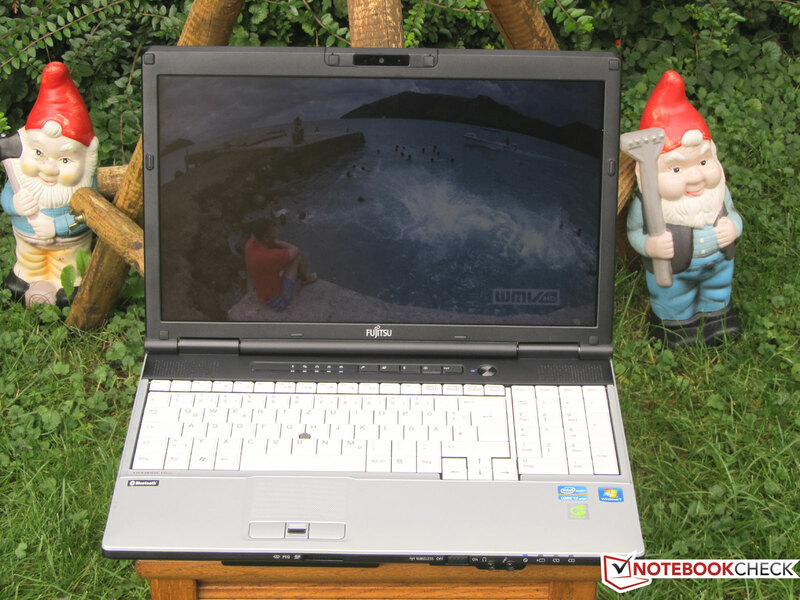 The Fujitsu LifeBook E751's viewing angles are not that great; only from optimal frontal vantage points or slightly to the sides were display contents well recognizable offering sufficient contrast. In our obligatory viewing angle tests, where the notebook gets rotated horizontally by 45 degrees in each direction, the display remained easy to see. Rotating the display vertically by 45 degrees up or down causes the image quickly to brighten or invert. 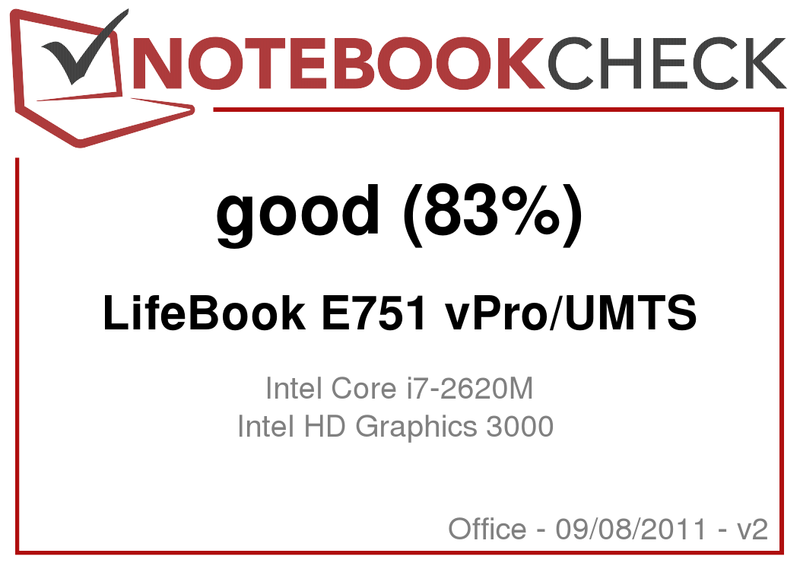 The LifeBook E751 vPro/UMTS comes equipped with Intel's Sandy Bridge Core i7 2620M with 4 MByte Level 3 Cache. This dual core processor has 624 million transistors on a 149 mm² DIE, using Intel's 32 nm High-K technology. Thanks to Hyper Threading support, it can process 4 threats simultaneously. Its clocked at 2.7 GHz, with Turbo-Boost overclocking of individual cores to 3.4 GHz when needed, so long as sufficient cooling keeps the chip within its thermal envelope. Intel also integrated its DirectX 10 capable HD 3000 GPU and a memory controller into this processor. Synchronization errors in the interfaces were not detected by our DPC Latency Checker software. As our screenshots show, none of the measurements slapped us with a red bar, so no limitations in the area of audio and video processing need be feared. In Cinebench R10 Single Rendering (64 bit) the Lifebook E751 concluded with 4684 points. In Cinebench R10 Multi Rendering (64 bit) benchmark the Fujitsu Notebook scored 11135 Points which is a good showing. For Cinebench R11.5 (CPU 64-bit-calculation) it looks no worse with 3.0 points. With the Benchmark PC Mark Vantage the system scored 6790, putting it in the mid range of notebooks with the Core i7 2620M tested so far. 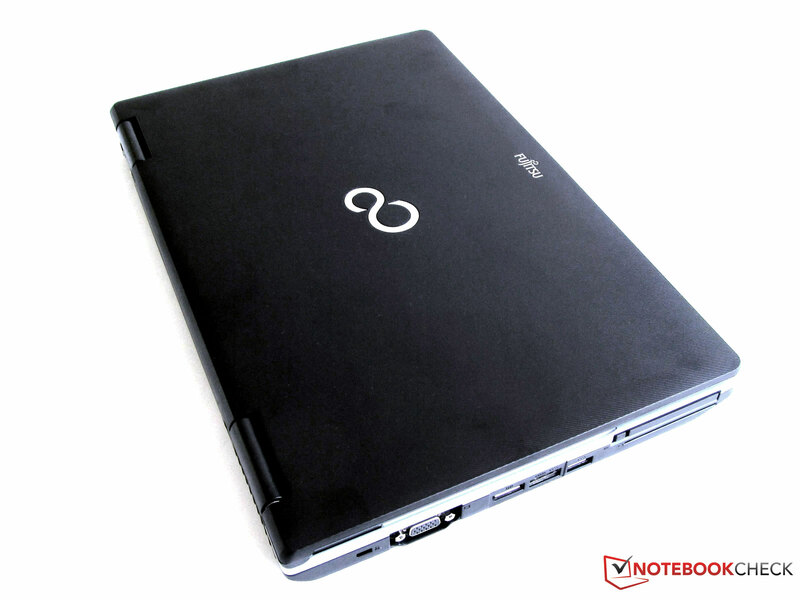 The Lifebook E751 sits neatly between the Acer TravelMate TimelineX 8573TG and the HP EliteBook 8460p in our performance listings. In the newest Benchmark-Tool PC Mark 7 our present test system scored 2195 and ranges between the HP EliteBook 8460p and the Acer TravelMate TimelineX 8573TG once more. Intel has made marked improvements in regards to graphics performance in the Sandy-Bridge HD 3000 GPU in comparison to the dismal Intel GMA series. This integrated GPU matches entry level discrete GPUs, like the Nvidia GeForce 310M, for example. Thanks to Turbo-Boost, the GPU is clocked dynamically between 650 MHz and 1200 MHz. In addition, the GPU can access the CPU's L3 Cache. Video and 3D performance of the Intel HD 3000 GPU in the Fujitsu Lifebook E751 ranges a little below expected results, with the exception of 3D Mark 06; 3D Mark 2001SE:11784, 3D Mark 03: 7299, 3D Mark 05: 4788, 3D Mark 06: 3624. 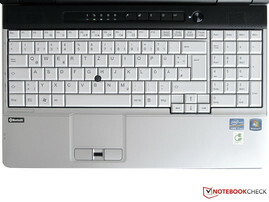 Comparable notebooks: Toshiba Tecra R840-11E or the HP Probook 6460b LG6445EA. The Benchmark 3D Mark 11 had compatibility problems with DirectX 11 and refused to run. Even with maximal power draw over prolonged periods of time (stress test), the dual core i7 2620M, in the Lifebook E751 remained at its clock speed of 2.7 GHz. 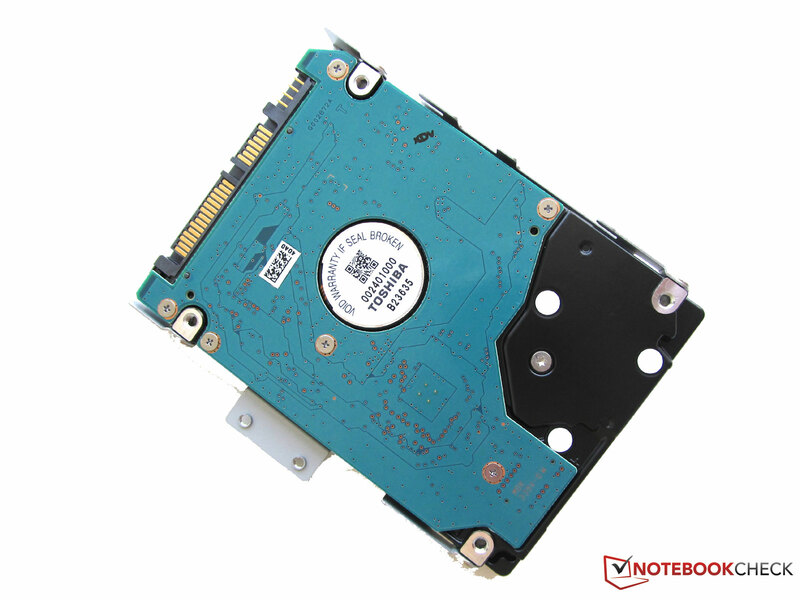 Toschiba's model MK5061GSYN hard drive offers 500 GByte, 16MByte cache and spins at 7.200 RPM. Average transfer rate was tested with HD Tune Pro at 56.3 MB/s. Access time hovered at 18.2 ms. CPU utilization was shockingly high at 29.3 percent. Disabling all factory installed and activated processes provided no relief. Other test software like "Disk Benchmark" from AIDA (previously Everest), showed CPU load over 29 percent as well. HD Tune Pro's transfer curve was very uneven, showing two many spikes up and down were recorded. This is not normal, leading to the low average values measured. Gaming on a Lifebook E751? Only in low resolution and detail settings. 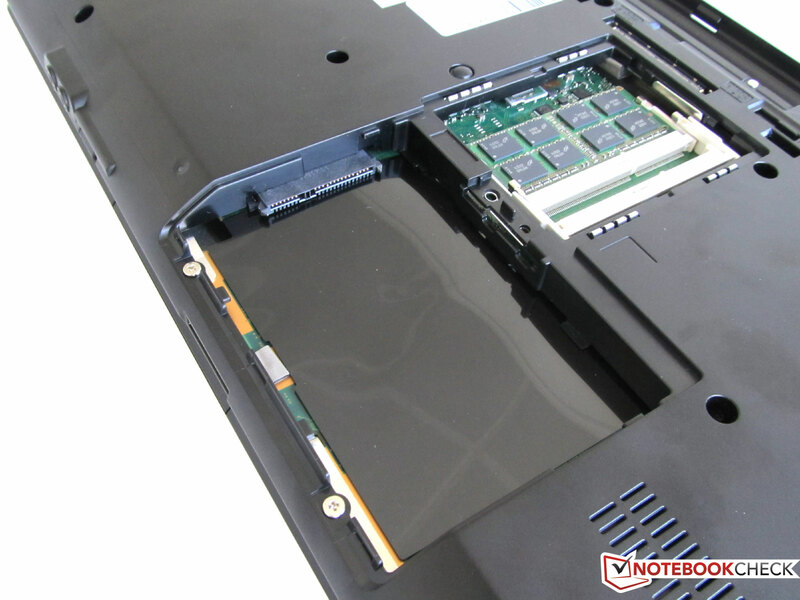 We already found with other notebooks, that you can play games with an integrated HD 3000 GPU like the Lenovo ThinkPad L420 NYV4UGE or the HP ProBook 6460b LG645EA if you can't avoid the associated pain. The Fujitsu E751 vPro/UMTS will let you do the same. 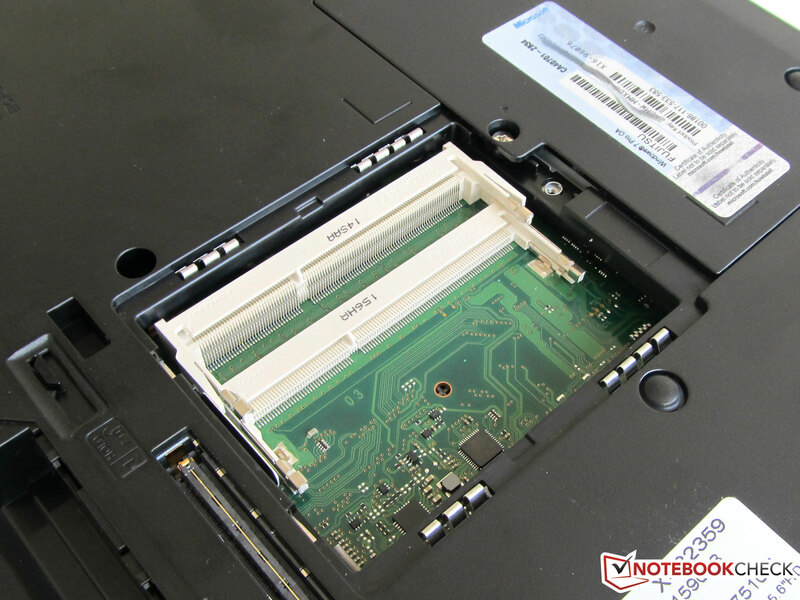 To see how the HD 3000 GPU does in this 15.6 inch notebook, we tested 4 games. "Dirt 3", allowed us to drift a few laps in the snow, but frame rates only improved with low resolution and detail settings. The Intel GPU completely failed with Mafia 2 the game was unplayable in any resolution/detail setting. FIFA 11 and Trackmania Nation Forever however played as expected, measured frame rates matched the values in our database. 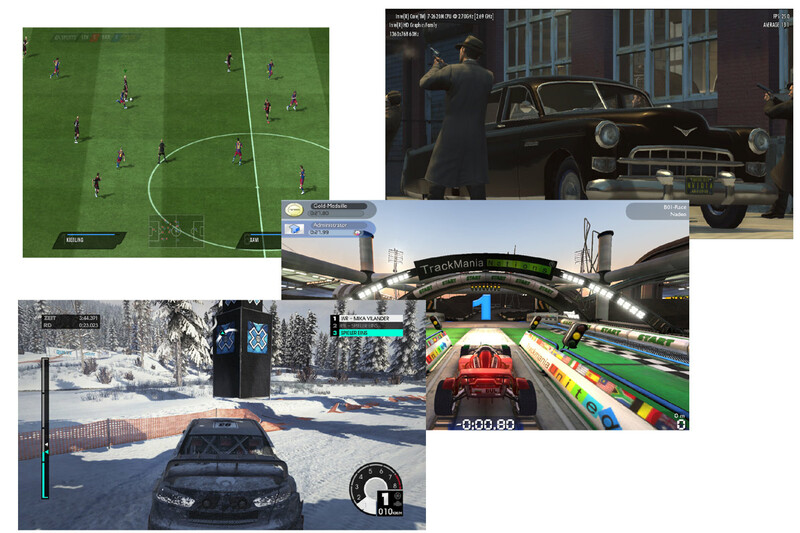 You can check which games will run on the integrated GPU in our "Computer games on laptop graphics cards database." Depending on CPU load, the cooling system of the LifeBook has to work pretty hard. At idle, the fan is hardly audible at 32.5 dB(A). With DVD playback, noise levels increased to 38 dB(A). Under load, the fan had to speed up noticeably, reaching a maximum value of 41 dB(A). The fan noise gets lost in the room with distance, and can't be heard anymore, once you get a few meters away. Even at idle, the bottom of the notebook measured up to 36.7 degrees C (98 F) in some spots. This value was not repeated on the top surface, but temperatures still rose to 31.4 degrees Celsius (89 F) in the center of the touch pad. Under load, surface temperatures rose markedly. A maximum value of 44.8 degrees Celsius (113 F) was measured on the left side, where the cooling system vent is located. The power supply gets taxed as well, and we measured 53 degrees Celsius (127 F) in comparison to 31.6 degrees Celsius (89 F) at idle. (-) The average temperature of the palmrest area of similar devices was 28.2 °C / 82.8 F (-5.3 °C / -9.5 F). 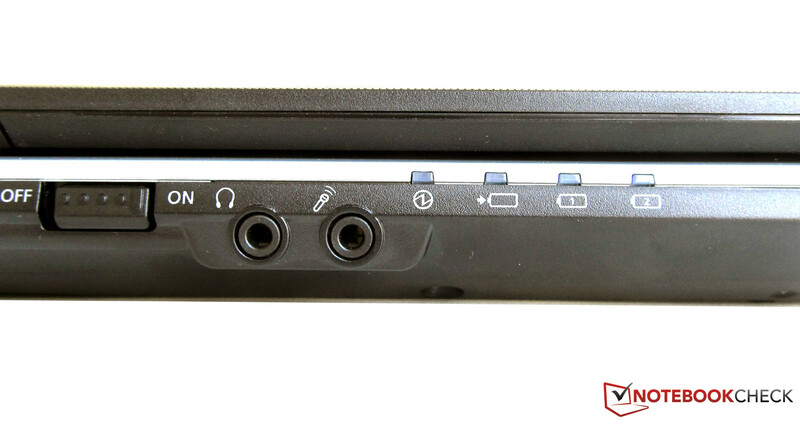 The two small speakers found above the keyboard to the left and right sides, could not convince us when testing the LifeBook E751 notebook. Music sounds unnatural and metallic, even at low volume. The more you turn up the volume, the worse the music soup gets. These two "noise polluters" are only useful for playback of system messages or maybe voice output. In stand-by, the Fujitsu notebook draws 0.7 Watt, when turned off just 0.2 Watt. At idle, (maximum display brightness, without energy saver and WIFI radio activated) up to 17.2 Watt are drawn from the grid. Under load (maximum display brightness, without energy saver and WIFI radio activated), we measured a maximum power draw of 66.6 Watt. You can feel the effect touching the power supply that heats up to 127 F.
The Fujitsu LifeBook is equipped with a 6 cell Li-Ion battery with 6,200 mA and 67 Wh. In our first run with the BatteryEater "Classic Test" (maximum display brightness, WIFI radio activated), the battery managed a run time of 1 hour and one minute. In the "Readers Test" with maximum energy savings, wireless radios off and minimum display brightness, the battery kept up for 382 Minutes. Surfing over the integrated WIFI connection is possible for 3 hours and 46 minutes, with the display at a comfortable brightness level. DVD playback only ran for 1 hour and 52 minutes with all energy savers and wireless radios deactivated. The battery charge cycle lasts 140 minutes; after 90 minutes, it was charged to 85 percent, with the last 15 percent taking another 60 minutes. Concept, hardware and scope of delivery of the Fujitsu Lifebook E751 vPro/UMTS convinced us in almost all areas. 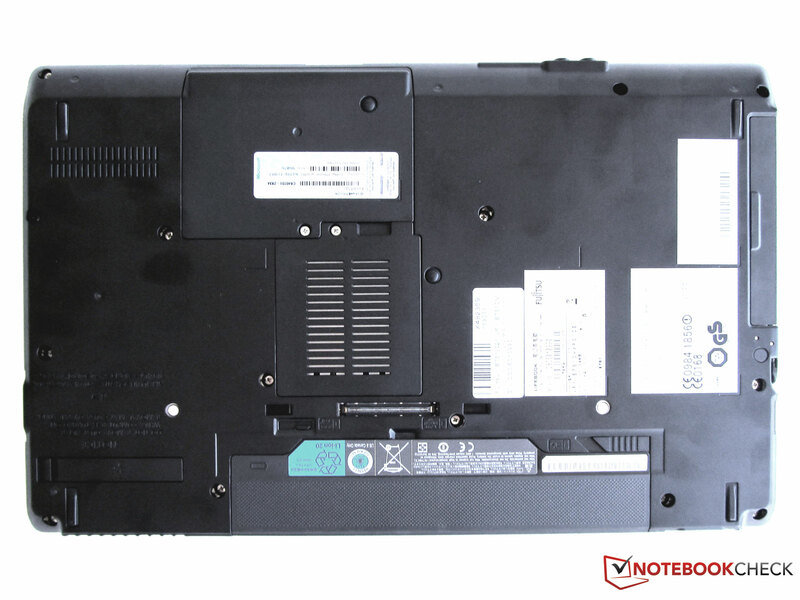 This Notebook was laid out for mobile office and internet applications, underlined by the integrated UMTS module and SIM card slot. 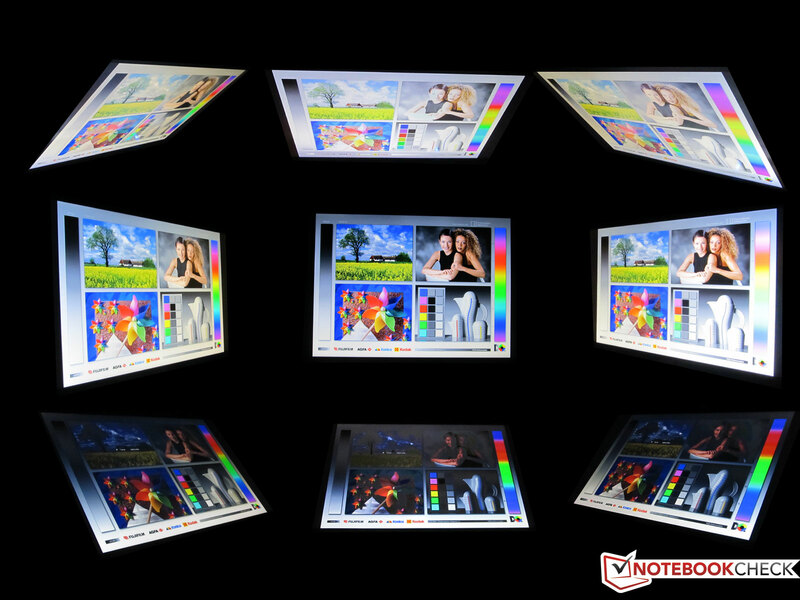 The notebook is equipped with a non-reflective 15.6 inch LED-lit HD+ display with improved resolution of 1600x900 Pixels, well suited for the office as well as field sales. Excellent inner values include Intel's second generation dual core processor, the Sandy Bridge based Core i7 2620M clocked at 2.7 GHz and an integrated Intel HD 3000 GPU, 4GB RAM and DVD writer. Only Toshiba's 500GB 2.5" hard drive couldn't impress in our tests and slowed down the whole system, in addition to causing significant CPU load. Values between 1 and 5 percent CPU load are normal for hard drives; this model managed 29 percent CPU load. We could not ascertain if this was a defective unit. Supplied accessories for the Lifebook E751 included a secondary power supply and a docking station, that also serves as charge station. MSRP for the Lifebook E751 vPro/UMTS in this version is 1,350 euros. Useful: slider to activate wireless connections. 500-GByte-hard drive with 7.200 RPM. Above the keyboard, many-colored LED's blink. Fingerprint sensor between the mouse buttons of the touch pad. 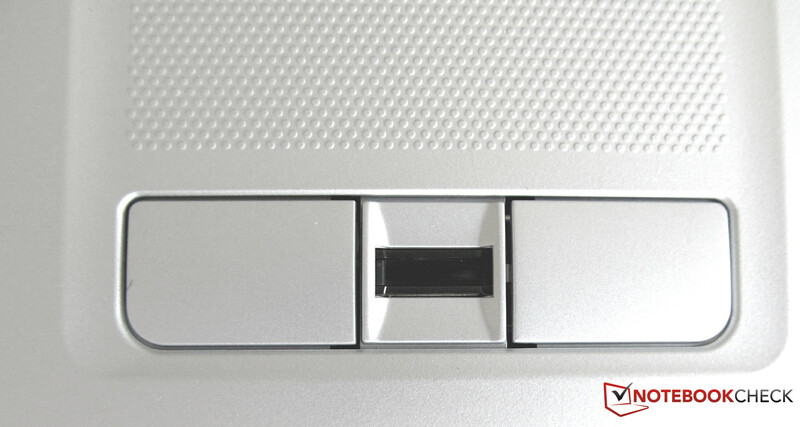 The modular bay is a great idea, allowing you to adapt the LifeBook E751 according to situation and usage with either a secondary battery, a secondary hard drive, or an optical drive. We missed nothing with this model; everything you could expect from a notebook is there. The fact that Fujitsu already includes docking station and secondary power supply.